Ada and Jamie Smith are sister and brother. Ada is Jamie’s older sister and was born with a club foot. Both of them lived in London, England during World War II with their cruel mother, Mam. World War II was a real war that England fought against Germany, Italy, Japan, Hungary, Romania and Bulgaria. 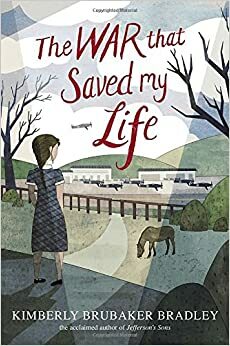 Ada, Jamie and Mam are not real people, but are characters in the book, The War That Saved My Life, by Kimberly Brubaker Bradley. Even before World War II, life was hard for Ada. Mam did not want a child with a club foot and did not want others to know about it. A club foot is a birth defect that can be corrected when a baby is young. Mam did not know that. She knew that Ada’s foot made her feel ashamed of her daughter. Mam called Ada a cripple and kept her locked up in the apartment, which in England is called a flat. Ada tried to obey Mam, but often pushed back. Mam beat Ada when she was bad and put her in a dark cabinet under the sink to punish her. Ada felt scared, angry, and ashamed when she was in the cabinet. She felt pain from the rough way Mam treated her and pain from her club foot. She felt scared to be locked up in a dark place. She felt angry because she had a club foot and because she couldn’t walk. She felt ashamed because Mam didn’t want her. She tried to stop her feelings by thinking about good things and going inward. Sandra Linn "The War That Saved Ada's Life" AwesomeStories.com. Nov 08, 2015. Apr 20, 2019.